The latest Irish mystery with Fidelma of Cashel! Peter Tremayne, aka Peter Berresford Ellis, is a mystery writer and a historian. His tales of Fidelma of Cashel, formerly Sister Fidelma of Kildare, are both delightful mysteries and insights into the church history of Ireland. The stories date back to the 600’s when a battle was being fought between the Irish Church and the Roman Church. Tremayne presents the story of that battle. 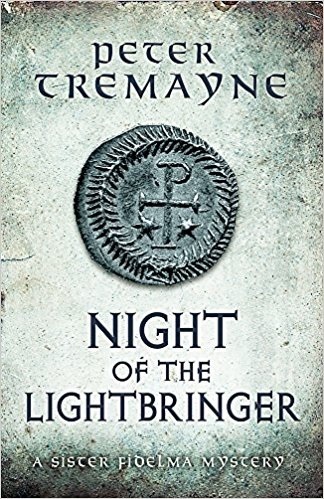 Tremayne states that the “New Religion” had come to the British Isles by the word of famous religious men such as Saint Patrick and Saint Columba. The churches they founded were later in disagreement with Rome over such doctrines as celibacy, the Virgin Mary, the dating of Easter, the church’s place with regard to the law, and even the tonsure favored by the brothers. Where the Roman Church pushed celibacy, the Irish Church had joint houses where married couples raised their children in the faith. The Irish Church recognized the law of the land, but the Roman Church felt that the bishops, abbots, etc should rule in cases of criminal conduct. They push things like self-flogging, hair shirts, and other things to mortify the flesh. They held that the death penalty was justified, and carried out by church leaders. The Irish Church fought these changes, often against abbeys and church leaders in their own locals. The Irish Church was eventually annexed by Roman Churches and married clergy outlawed and all religious houses separating men and women. These stories take place within that battle. In the many churches and kingdoms of Ireland, murders seem to be not that uncommon. Fidelma is assisted by Brother Eadulf, a Saxon who met her during a church doctrine meeting, later her husband. In his home country, Eadulf had been what could be termed a law officer, and he has the same detective senses that Fidelma possesses. While she is his superior in deduction, he often displays insight that helps to solve the crime. I give the book five stars, for both the mystery and the historical information! Please do not stop writing, Mr. Tremayne!